Chicken Chasers is a local neighborhood restaurant with great food and an all American menu. Full menu served weekdays, excluding weekend specials. Visit our Facebook page to see our other weekday specials! Consumer Advisory: Hamburgers and steaks served medium, medium rare, or rare may be under cooked and will only be served at the customer's request. 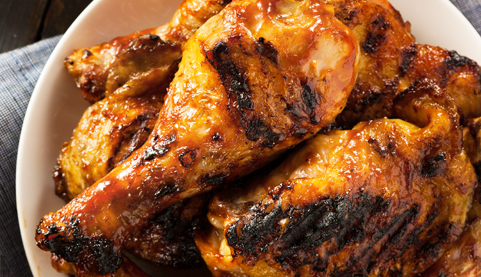 Consumption of under-cooked food may increase your risk of food-borne illness. Our customers love these classics, true to Satch's original recipes served at Chicken Chasers for over 40 years. Stop in to Chicken Chasers today! Stop by Chicken Chasers for these fun annual events. We are easy driving distance from Eau Claire, Chippewa Falls, and Menomonie, Wisconsin. We are located in beautiful Fall Creek, Wisconsin. Stop by our restaurant today for a delicious, home-cooked meal. 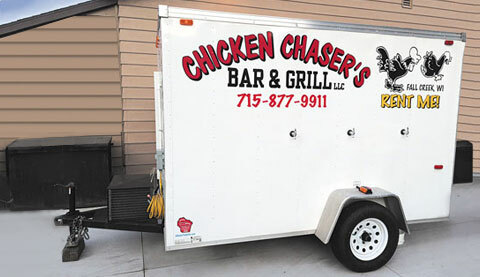 Chicken Chasers provides all American catering for reunions, graduations, weddings, and business meetings. With years of catering experience, you can expect the best in food and friendly service. We would be thrilled to cater your next event at the location of your choice. We will work with you to create a custom menu that you will love, specialized to suit your taste, guests, and budget. We look forward to meeting with you soon. Call (715) 828-4803 today to reserve catering for your next event! Reserve our cooler trailer for your next event for only $125. Call (715) 828-4803 today to learn more. Check out our full menu! Thank you for letting us serve you! We value what you have to say. Please share your story about Chicken Chasers Bar & Grill, dining and catering in Fall Creek, WI.